Lance Armstrong‘s long-time manager, Johan Bruyneel received a 10-year ban from sport this morning from the American Arbitration Association (AAA). In its case against Armstrong in 2012, the US Anti-Doping Agency (USADA) showed that the Belgian helped and encouraged his riders at teams US Postal Service and Discovery Channel to dope. The panel also banned former team doctor, Pedro Celaya and trainer, Jose ‘Pepe’ Martí for eight years each. “Our investigation has focused on ridding cycling of those entrusted to care for the well-being of athletes who abuse their position of trust and influence to assist or encourage the use of performance-enhancing drugs to defraud sport and clean athletes,” said USADA CEO Travis Tygart. 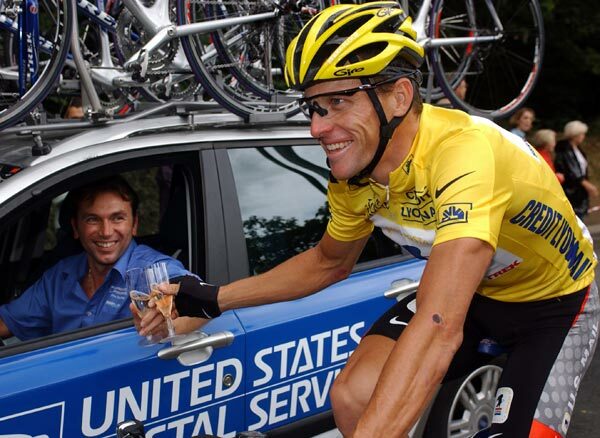 The US agency published its Reasoned Decision that led to a life-time ban for Armstrong on October 10. The ruling saw his seven Tour de France titles stripped. Bruyneel managed Armstrong’s teams en route to those titles. “Johan Bruyneel was intimately involved in all significant details of the US Postal team’s doping program,” the agency said in its Reasoned Decision. “He alerted the team to the likely presence of testers. He communicated with Dr. Ferrari about his stars’ doping programs. He was on top of the details for organizing blood transfusion programs before the major Tours, and he knew when athletes needed to take EPO to regenerate their blood supply after extracting blood. He was present when blood transfusions were given. He even personally provided drugs to the riders on occasion. The agency’s report already led to lifetime bans for Italian Michele Ferrari and Spaniard Luis Garcia del Moral. The report and looming hearing led to Bruyneel losing his job as team manager at RadioShack in October 2012. It ended a career in cycling, which included racing as a professional in teams Rabobank and ONCE and two Tour stage wins. His ban will end on June 11, 2022. “I do not dispute that there are certain elements of my career that I wish had been different. Nor do I dispute that doping was a fact of life in the peloton for a considerable period of time,” Bruyneel said today. The 49-year-old Belgian lives in London. Though he managed US teams, he said that the US agency and the arbitration are acting outside of their jurisdiction. He explained that he is considering appealing the decision.